What with invisible ink, yetis, and earthquakes, the world of Government publications can be so diverse and intriguing that it’s easy to lose track of sober perennials like the U.S. Government Manual. I’ve used this great book throughout my career in the Federal Government to get contact information for the right part of a large Federal agency or verify that a smaller, more obscure one actually existed – and what it really did. Thanks to the diligent folks at the National Archives and Records Administration’s Office of the Federal Register, you can ferret out phone numbers, mailing addresses and URLs that really work, or just read through each agency entry to better understand its particular missions and activities. It’s perhaps the premier annual reference book for all three branches of Government. Some innocuous agency names conceal more interesting activities. There couldn’t be a blander, more bureaucratic sounding name than The Office of the Coordinator of Information (1942). It quickly changed to the Office of Strategic Services (OSS) which, under the charismatic leader of William J. “Wild Bill” Donovan, conducted U.S.espionage and sabotage activities for the European Theater of Operations in World War II and was the progenitor of today’s Central Intelligence Agency (CIA). Then there was the Virgin Islands Company (1934-1966), a New Deal Government corporation established to grow and refine sugar cane and manufacture and sell rum in that beautiful U.S. possession. 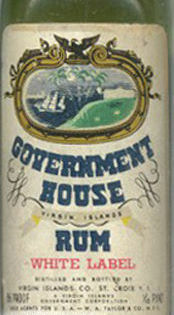 It marketed rum under the name “Government House.” The label (left) featured a sailing ship, a palm tree, and a harbor, and supposedly was designed by President Franklin D. Roosevelt himself. How else could I find out about this stuff if not through the pages of the U.S. Government Manual? If you need a source of the latest information about any Government agency, or if you’re just curious about the innumerable nooks and crannies of the Federal establishment, the U.S. Government Manual is for you. You can browse it here, get a print copy of the 2011 edition here, or find it in a library.